Whether you are looking freshen up an outdoor or indoor space we have solutions for you.We specialize in orchid and bromeliad plants and can provide beautiful Italian containers or we can utilize what you already have. We can maintain and replenish your plants as needed for you. Our maintenance services may vary due to factors such as sunlight, however we typically set up multiple visits per month and will replenish the plants as needed. Our customers include restaurants, hotels, real estate offices, residents, Condo associations and more. 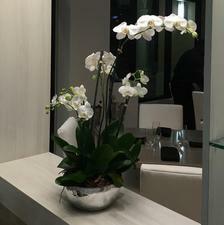 We can design custom plant arrangements that suit your needs and the best part is that we will maintain them, taking the worry out of having a unique and beautiful display.